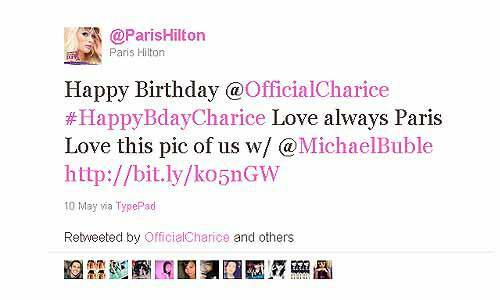 (SPOT.ph) Socialite and hotel heiress Paris Hilton greeted Filipina singing sensation Charice Pempengco on her birthday via Twitter, reports Manila Bulletin. The 19-year old singer celebrated her 19th birthday on May 10 and Hilton was among the well-wishers who sent their greetings through the social networking site. Hilton tweeted: "Happy Birthday @OfficialCharice #HappyBdayCharice Love always Paris Love this pic of us w/ @MichaelBuble http://bit.ly/k05nGW." Charice replied to Hilton with the message, ""@ParisHilton thanks again!!!! Love always! -C."
According to Manila Bulletin, Charice first met Hilton in 2009 when she was invited to perform at the Academy Awards' after-party at Mr. Chow restaurant in Hollywood. Charice was quoted as saying, "She's [Hilton] very nice pala." They recently crossed paths during the Manny Pacquiao-Shane Mosley match where Charice sang the Philippine National anthem. Charice is set to release her sophomore album on May 31.